I have a problem with Opera and some other applications where I can't use keyboard shortcuts like CTRL+C when I select some Cyrillic keyboards are selected, like Serbian and Russian. 1. in Opera (9.62, 9.24) keyboard shortcuts for cut, copy, paste (ctrl x, ctrl c, ctrl v) dont work when keyboard is set to Serbian cyrillic (works with original kernel). 2. in text editor AkelPad 4.2.2 when keyboard is set to Serbian cyrillic it dont type cyrillic characters (works with original kernel). In some other text editors (BDV notepad, Notetab light, Notepad, Wordpad) Serbian keyboard works fine. Hi RetroOS, would you mind sharing a few link with applets not working if you can remember any. 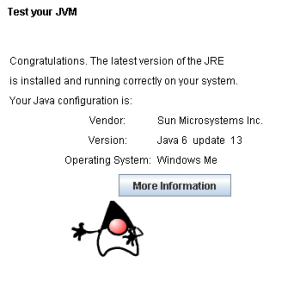 I have installed java 6 update 13 over update 7 since a few days and I have not encountered any problems with the java apps I have installed on my computer. It was web pages with java applets. For example, the Sun Java test page shows a blank space where the java information and test animation should be. It works well with Opera 9.64 and Java 6 update 13 here. I can't test with another browser as I don't have Firefox and my IE does not have Java installed. I have also been running several applets I had downloaded without problems with the appletviewer executable from an old java sdk that was installed on my machine. I just needed two files from the sdk for that, appletviewer.exe and jli.dll. It doesn't read applets directly, you need to feed the appletviewer with the html file that contains it but it will run the applet only. A rather nice little tool for running applets without a browser btw. I am not sure it crashes in user.exe when RP9 (+ RP10 Alpha 2) is not installed as I got it to crash only in kexbases when RP wasn't installed. Opera always crashes in kexbases.dll or user.exe when launched from Wilma. It appears that you're running Wilma with XP-compatibility level, am I right? In this case all child processes (including Opera) will also be running under this compatibility level. Opera doesn't like XP level. For the time being try setting "Windows 98" compatibility level for opera.exe. Compatibility level for Wilma is 2KSP4 and the problem is fixed indeed by setting Windows 98 or ME compatibility mode for Opera, didn't think about trying that obviously. Flash 10 and Java 1.6.0_13 still working fine in Opera after doing that so no need for another fix I guess. Thanks for the head up. Today, Adobe released new versions of Flash Player 9 and 10. 9.0.246.0 works perfectly under Opera 10 Beta 2 but I have some problem with Firefox 2.0.0.22 pre and SeaMonkey 1.1.17 (without KernelEx of course). 10.0.32.18 refused to install (complaining about older operating system) despite of registry trick and setting KernelEx 4.0 Final in Windows XP SP2 compatibility mode for it. Btw it's an NSIS installer and there is a problem with running the newest NSIS installers It would seem. See just above about foobar2000 for another example. Java 6 Update 14: How I've got it working in Windows 98SE with Internet Explorer and Firefox. I have KernelEx 4.0 Final installed, but this proceedure may work with earlier versions too. Use Windows Explorer to navigate to this folder (copy and paste the above line into the Address box). Windows Server 2003, Windows 2000 Professional (SP4+), and Windows Vista. After install, the following setting must be disabled to ensure Java applets work. Now you should be operational with both Internet Explorer and Firefox, Opera, and others. A/ With 7zip unpacking only files NPSWF32.dll and replace same file (9.0.246.0 / Firefox 2 (last official 2.0.0.20) in directory Plugins. Flash work perfectly, including flash manager http://imageshack.us (old problem with 9.0.45.0 to 9.0.124)!!! B/ Firefox 2.0.0.20 with FashPlayer 10.0.23.18 (only replace files NPSWF32.dll / Plugins) - work too perfectly. C/ Firefox version 2.0.0.22pre NO with FlashPlayer 9.0.246.0 - fatal error. I extract NPSWF32.dll vers. 10,0,32,18 on directory Plugins (npnull.dll old - 1, 0, 0, 15) - work perfectly! D/ Firefox 3.5.1 with 10.0.32.18 (only copy NPSWF32.dll v. 10.0.32.18 and flashplayer.xpt (extract with 7zip) in directory Plugins) - work OK.
E/ Opera (last) FlashPlayer 10 - OK.
Notice: All only with replace files NPSWF32.dll (all) and flashplayer.xpt (Opera). What I have to add is that I have just tested JDK 6u14 on a fresh system and it installs flawlessly (including bundled JRE 6u14). Well I have just downloaded the jdk and it installed the bundled jre without a problem but as I feared jar files don't execute anymore and Opera now spontaneously exits/crashes when I go on a page that has a java applet. Can anyone confirm that or not ? Edit : OK I got it working, no worries. I had to fix the registry and adjust certain paths by hand because I had previously created keys for update 15 in the registry and the update 14 installer apparently made them the default ones so there was some mismatch I guess. Thanks for the head-up again btw. And it seems to be working well here as I never experienced the error reported by RetroOS. Btw I don't need to uncheck the "use new plugin" in the Java control panel to have it to work properly in Opera at least. I dunno about IE yet because my botched installs and messed-up java registry keys have not been fixed as far as the IE plugin goes. The update 14 installer run from the jdk installer also wrote all the nearly 300 CLSID keys the IE plugin uses to make them point at my manual update 15 installation. I did run a registry search and replace in the classes_root key to correct all those paths but this had the weird result that if I now go with IE on a page that contains an applet, then the only thing that does happen is that two instances of java.exe succesivelly execute from the update 14 directory and pop up briefly on screen, lol. Obviously Opera works without disabling this setting. However there is one major problem. When I click on the Delete Private Data tab the browser locks up which it did not do when I was running Opera 10.0 (the last one that worked on W98SE). I tried unchecking some of the tabs in the drop down box regarding what Opera will clear when you click on Clear Private Data, but that didn't work. Something else is causing the problem. Anyone know how to tweak that utility in Opera 10.10 in conjunction with Kernel EX? I find Opera faster than Firefox, especially Firefox 3.57 compared to Firefox 2.0. Go to Bookmarks / Manage Bookmarks / View. Check Sort by My Order Close down Bookmarks. Go to Tools / Delete Private Data / Detailed Options. Uncheck Clear bookmark visited time and Close all tabs. Delete Private Data then works perfectly. I start off Miranda IM and start browsing net with Opera 10.something, after a while, some icons get los, some GFX disappears. Later on scrollbars go corrupt and in the end all the window frames and such. The corruption changes with what goes on screen, so I guess some memory gets overwritten or something like that... I had to take photos on some occasions since when the resources are too low, one cannot make screenshots (you get only 1bit B/W shot). Perhaps RP9 and KEX do not get along anymore ? I start off Miranda IM and start browsing net with Opera 10.something, after a while, some icons get los, some GFX disappears. Looks like GDI resource leak. Does quitting Opera helps?